but do remember that these are all already automated by WhatsApp itself, the WhatsApp has an automated system that creates a backup of conversation automatically every morning 4 AM, a maximum of 7 days backups will be stored in the Whatsapp database and new backup's created there on will overlap the existing old backup files. Note: The backup file will contain only text conversation and thumbnails of the media files path, if the images/videos are removed from the device and also unavailable in the source then it will result in download error and cannot be recovered. We remove something from our device that no longer required to exist in our device, But what if you have accidentally deleted a text conversation happened with your friend last day and want it right now back in your device. However, we may not remember the whole conversation, but we can remember the date that conversation happened or the date we deleted it from the device. It doesn't mean that you cannot recover the WhatsApp messages if you have forgotten the date, but remembering the date will facilitate the process in a single attempt of recovery. Recovering WhatsApp deleted text messages and conversation is not a difficult task if it is less than 7 days, because the backup will be created every morning 4 AM automatically and stored in either internal or external storage location, so even if you delete a conversation its easy to recover it from the database. There is no wonder recovering WhatsApp chat in this way, besides its already recommended by WhatsApp itself to its users, if you're not aware of it, just do these steps. Re-Install WhatsApp and during installation it will prompt to restore the message back to device. Click Restore and you're done. 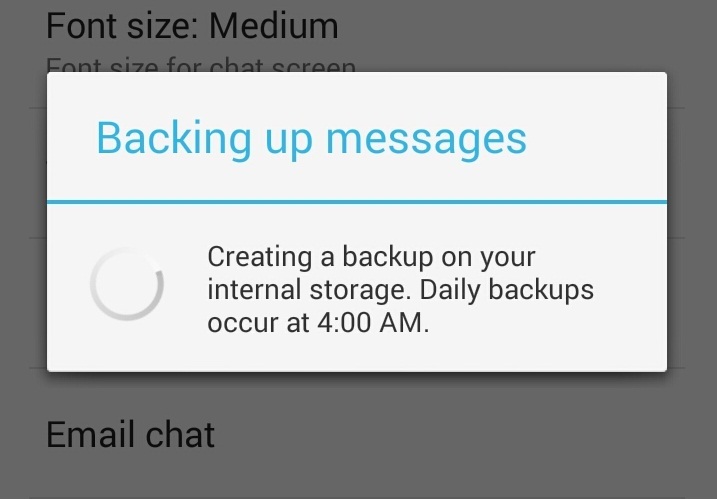 How to Recover WhatsApp Messages from Backup file ? By default WhatsApp creates backup of chat history up to 7 days and overwrites the backup files with new one's created everyday. 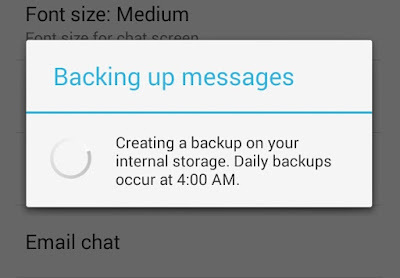 But if you need backup of everyday chat history than open WhatsApp settings->chat settings->and tap on backup chat to generate backup file separately that will not overlap with the new backup files created by WhatsApp automatically, do this sequentially to create backup's of everyday chat history that are not removed from WhatsApp database. Important Note: Only backup files that are created manually through the chat settings will be recovered and restored from WhatsApp database even after several months. Backup files that are created automatically by a WhatsApp will be overlapped with new backup files, hence every 7th day backup file will be pushed out of memory and the backup file next in queue will occupy its place then vice versa. Unlike recovering recent chats, recovering and restoring chats from the backup file is not easy if you don't know the trick, but here we will make it simple, just follow these simple steps. In database folder you will find list of backup files created manually by you and automatically by WhatsApp. 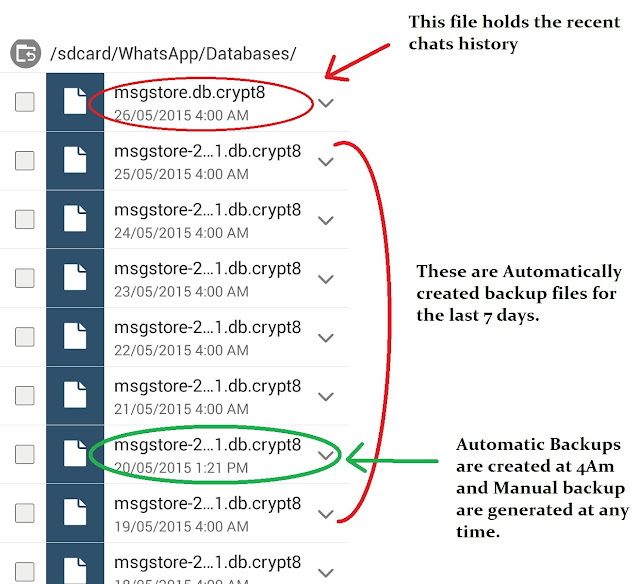 Rename "msgstore.db.crypt8" to any other file name for eg: "old.msgstore.db.crypt8"
And then choose which file you want to restore and rename that file from "msgstore-YYYY-MM-DD.1.db.crypt8 " to " msgstore.db.crypt8 ". During installation of WhatsApp it pesters a window to restore message from backup, tap on restore to recover the message. 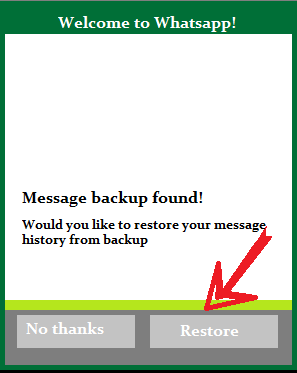 If you have forgot the date and month of the conversation, and not sure about which backup file to choose for restore and recover, visit recovermessages.com and upload the backup file and view the messages in it, and once you find the required message, note down the date of the backup file and then proceed with the above mentioned steps in Android mobile.